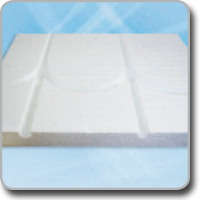 Maincor Floating Floor Panels are for use with the heat emission plates. The boards are made from pre-routed expanded polystyrene. When used in ground floors, additional insulation may be required to comply with Part L of the Building Regulations. Panels are available in different thicknesses and centres.